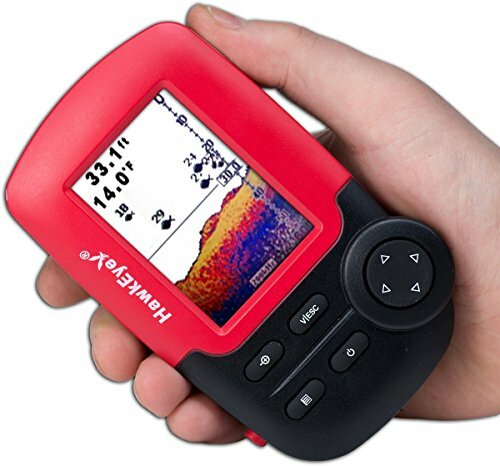 If you’re looking for the best small boat fish finder, I’ve got you covered. I know it can be frustrating trying to sort through all the specs and data, so I’ll narrow it down for you the best I can. 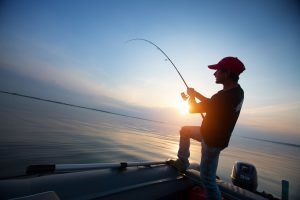 Let’s face it; those of us who prefer small boats, like a Jon boat or even a kayak or canoe, still deserve the same treatment as those guys zipping by us burning gallons of gas and waving two hundred dollar rods at the bass. Not that there’s anything wrong with that. I have a big boat too, but sometimes I just want to relax and hear that gentle whir of the trolling motor, or watch the swirl of my oars on top of the water. 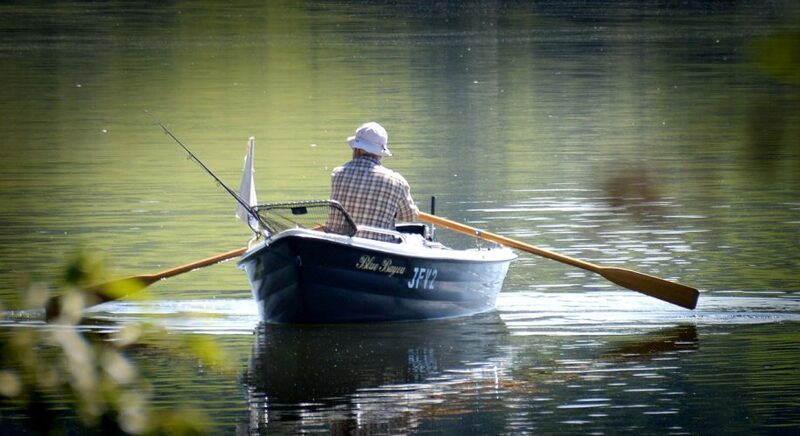 I like hearing the water drip from the end of my oars, it gets me closer to nature, closer to the fish I’m catching. 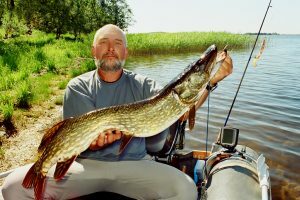 And heck, some of my biggest fish caught and most memorable days on the water have been when I’m just paddling around a small pond, throwing a rubber frog at patches of lily pads. Sounds kinda corny, I know, but I think it’s real fishing. Brings me back to being a kid again. Let’s take them on in order. Depth finders come in all sizes, but with space already at a premium aboard smaller craft, this is one of the most important considerations. When choosing the best depth finder for a small boat, you need to strike a balance between size and functionality. Where will I be doing most of my fishing? 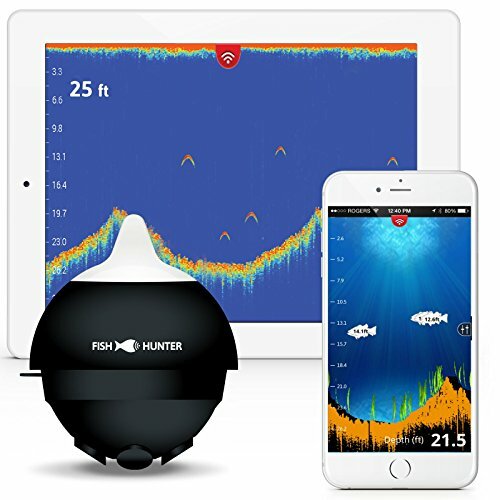 What features do I want to have in my fish finder? Manufacturers have packed plenty of punch into a small package these days, and one of our favorite units for small boat fishing is the versatile Lowrance Hook 4. 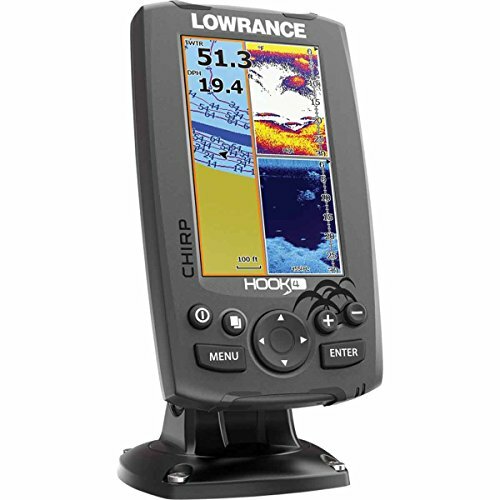 Check out some of the features on this power packed depth finder. This unit does it all, and for a pretty fair price. The controls are a breeze to get used to and you can operate it with just a single thumb. The display is fairly easy to see, although direct sunlight is sometimes a challenge. 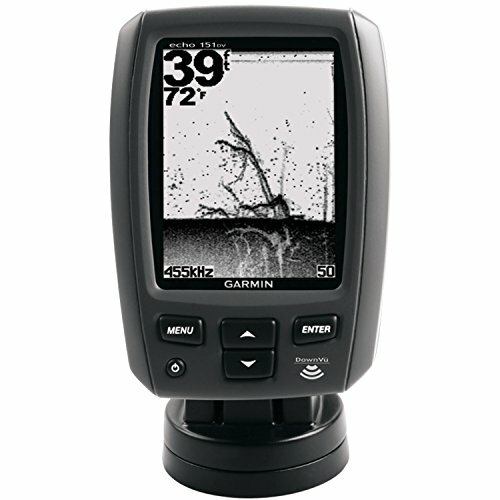 Another excellent choice for a small craft fish finder is the Garmin-Echo-151dv. This is another 4 inch display unit, and the pixel count is 160X256. That’s pretty good resolution for a unit this size. For power, this Garmin will rely on your 12 volt battery. This fish finder comes with a water temperature function, and also has a transom mount as well as a trolling motor mount for the transducer. Note that Garmin advertises this as an 8-level gray scale display, not color, but to me the display looks almost as good as a black and white photo. Simple controls – the menu and settings are simple and straightforward. No messing around on the water. Maximum depth is 1600 feet, more than enough for any fishing situation you’ll find yourself in. 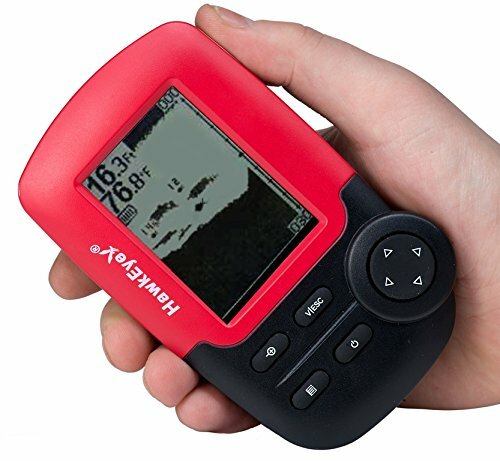 A couple of cons with this fish finder include the fact that there is no side-scanning capability, as well as no GPS, but I find that both of these features are not that important to me when fishing from a small boat. The lakes and ponds I fish with my Jon boat are all pretty much shallow water affairs, with none of them running more than 40-50 feet deep. For these smaller bodies of water, most depth finders are more than adequate. 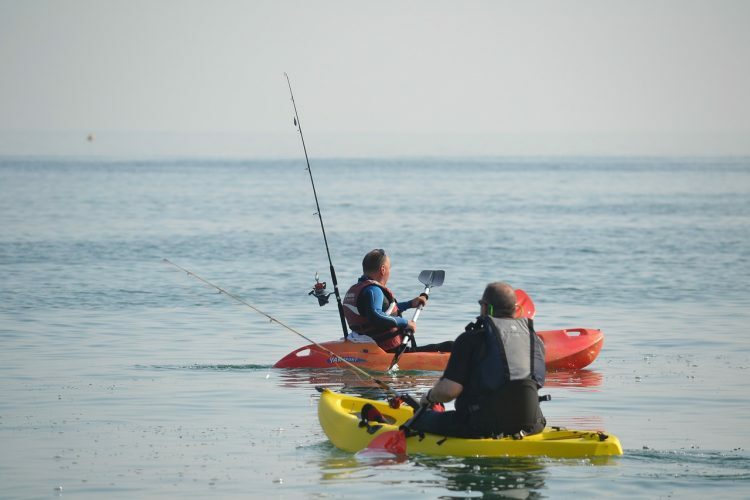 If you’re using a kayak in the ocean you may want to refine your search a bit, but for most small water applications, all the units we’re discussing here will work great for you. Note that some depth finders become highly inaccurate when operating in extremely shallow water. You’ll also need to pay attention to where you mount the transducer. Mounting too close to a place where the water will become turbulent can also lead to inaccuracy. Also, these types of fish finders may not do well at high running speeds. 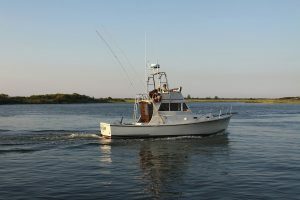 Typically, fish finders mounted through the hull are more accurate under higher speed conditions. Mounting through the hull may not be an option for you in a small boat. 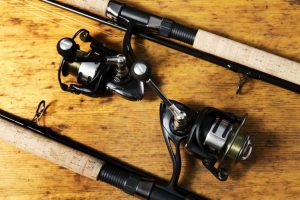 Most of these types of units are considered portable, and as such they usually all come with a way to mount it to your boat’s transom or attach it to your trolling motor. These are good options and won’t affect the performance of your unit as long as you follow mounting instructions. 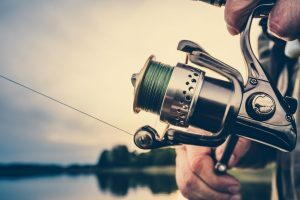 Power sources vary, and you’ll need to check the manufacturers specifications to be sure, but most fish finders will tie right into your 12 volt trolling motor battery. There are some ultra-portable models, however, that use rechargeable batteries that don’t rely on external power sources or have any extra wires to complicate things on your small water craft. As the old saying goes, you get what you pay for. I use the same rule of thumb as I do when buying a computer, and let’s face it, these fish finders really are small computers, aren’t they? I buy as I can afford at the time of purchase, and if I see a better unit with features I like and will use, then I generally stretch my budget so I can get the most bang for my buck. But I always make sure to check whether or not I’ll need the features I’m paying extra for. For instance, a GPS is a nice feature to have on a fish finder, but I already have a handheld GPS, so I really can live without it if I have to. You can spend less than $100, and you can also spend $300-400. 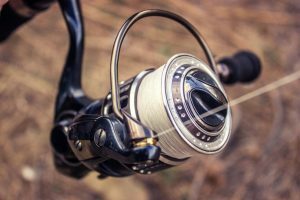 The more you spend, the better your fish finding experience will be, in general. All of the units we previously discussed can be classified as portable, but there are a whole range of new fish finders that take portable to a whole new level. What about reading your depth finder on your smartphone? For a truly portable solution that’s been getting some really good reviews, you need to check out this High Tech Beauty! This unique piece of gear is a great addition to your fishing arsenal, especially if you’re like me and a bit of a techno-nerd. The learning curve is not too bad on this baby, and it’s a lot of fun to work with once you get used to it. Reads depths down to 150 feet, plenty of range for most small water applications. 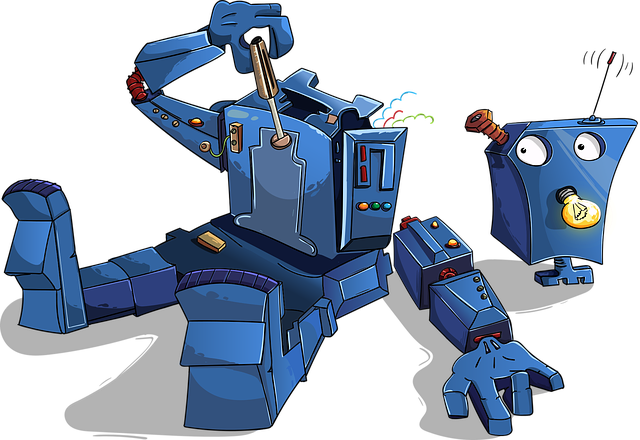 Technologically speaking, this unit is fantastic in concept and execution. For the bodies of water I fish, it’s ideal. And you really don’t need to have a boat to use this, you can actually cast it from shore! The Hawkeye portable fish finder comes in a few different flavors, and they’re not a bad deal for a truly portable unit. The Hawkeye FT1PX is a dot matrix display unit that’s powered by 4 AAA batteries. Its display features water depth, water temperature, bottom contour, composition, and shows fish on the screen as well. One of the coolest features about this unit is the way you can configure it to match your fishing needs. 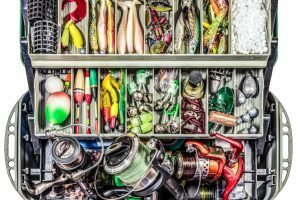 You can choose kayak, canoe, boat, float tube, or even shoreline fishing, then choose the accessory kit that meets your needs and adapt this little beauty to any fishing situation. And the upgraded version, the Hawkeye FT1PXC, features a color display that is easy to read even in tough sun conditions. 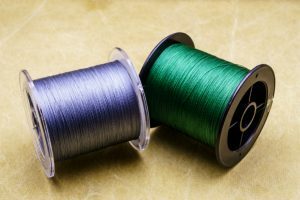 When I fish small water, space it at a premium and I don’t want a lot of wire running around the bottom of the boat. This unit is perfect for fishing with a small boat or kayak. You can even buy a handy carrying case for it that’s a great investment to keep the unit protected. 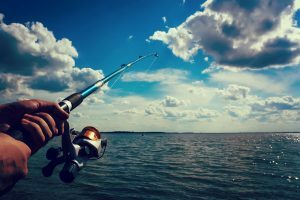 There are many options for small boat fish finders, and one of these should meet your needs.